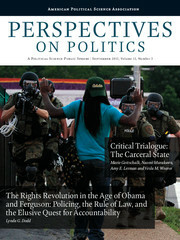 The September issue of Perspectives on Politics features a range of articles, essays, book reviews, and dialogues on “The American Politics of Policing and Incarceration.” We started planning this issue 15 months ago, long before “Ferguson,” and “Freddie Gray,” and a rash of high-profile instances of policing run amok. We chose this topic because it is important for politics, especially in the United States, and for American political science. Until recently, the conventional political science approaches to the study of American politics have been rather silent on policing and incarceration. In the past 10 years the “Big Three” of American political science journals, that is, the top journals publishing conventional empirical research on American politics—the American Political Science Review, American Journal of Political Science, and Journal of Politics—have published only a handful of pieces combined related to policing and incarceration. That’s five pieces out of hundreds of published articles. Recently, two things have become clear. First, many people in the United States—citizens, community activists and organizers, legal professionals, economists, journalists, and some law enforcement professionals—are seeing that policing and incarceration policies, once seen as peripheral, is now increasingly central to our politics, and is a serious normative blight on and political dysfunction of American democracy. Second, political scientists are showing a rich, exciting, and growing attention to these themes. This work in Perspectives might not (yet) represent the new mainstream of American politics research, but it represents a major development that invigorates the study of American politics. This issue of Perspectives features this excellent work because it highlights themes that should be more central to the understanding of U.S. politics and of politics in general. Indeed, some of these themes figure prominently in political science research—but typically with regard to discussions of “authoritarianism” or “repressive regimes” in places like Africa or the Middle East. Clearly, a truly general, comparative, and nonparochial political science must realize that policing, police brutality, incarceration, and repression are not limited to authoritarian regimes. These also play an important role in the functioning of polyarchal, “democratic” regimes. Political science must be more serious about these topics. The pieces in this issue of Perspectives suggest an increasing awareness on the part of our political science colleagues. The American Politics of Policing and Incarceration, by Jeffrey C. Isaac, Perspectives on Politics Editor / Volume 13 / Issue 03 / September 2015, pp 609-616.